The REAL PRO Double Super lens kit includes a Super Wide 165° lens and a Super Macro 6x lens. The Super Macro 6x lens is composed of two macro lenses with a different magnification power of 3x and 4x respectively. You can use the two lenses separately or combined together, for a 6x magnification power never experienced before until now! The focus hood included in the set will guarantee stable and blur-free pictures while keeping the subject always in focus. Challenge yourself in a wide range of fields with this REAL PRO Super Double Kit of “Super Macro & Super Wide 165°” clip lenses and bring your smartphone photography to the next level. The Super Wide Lens contained in this kit is an optical lens with 165° field of view that offers the best choice for shooting group photos, selfies, landscapes, and snapshots. The Super Macro Lens is an invitation to the curiosities of the macro world. 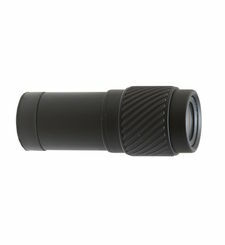 It consists of two macro lenses with different magnification power. You can use the two lenses separately or, by combining them, shoot photos or videos with a 6x magnification lens that you have never been experienced before… until now! The Super Wide Lens & Super Macro Lens Double Kit is also enriched with a new focus hood. Just by applying it on the surface of the object, the focus hood included in this set will guarantee stable and blur-free pictures while keeping the object always in focus. More and more people recognize smartphones as a high-performance camera. It is difficult to deny that smartphones with their advanced camera lens system and editing tools will continue to conquer the market in quite a confident manner. We believe that smart phones photography as an autonomous genre will keep developing to further provide users big possibilities to express themselves. Despite the big competition out there, Kenko offers a range of high quality optical add-on accessories for smartphones that will help you to show YOUR hidden talents to the world. This new REAL PRO CLIP LENS Double Super Lens Kit makes a further step forward by increasing the number of situations in which you can take great and impressive pictures conveniently with your smartphone. Kenko REAL PRO CLIP LENS Double Super Lens Kit provides different scenarios to be used in. By including a super wide lens and a super macro lens, this kit has been conceived to cover all your everyday life situations, may they be at work, school or free time. With REAL PRO CLIP LENSES, your every day photos will become more impressive and creative. The Super Wide 165°lens is of particular help when your smartphone camera angle needs an additional conversional lens to cover the whole view you want to capture. 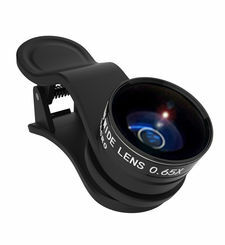 This Super Wide 165° clip lens will serve a great deal particularly in landscape pictures, group selfie photos or snapshots. The Super Macro lens, in particular, can be of much use in the children education process. Bring this lens with you out in the fields and look for any object your children get curious about. This is a great opportunity to let them into the wonderful world of macro. You can use the Super Macro lens in health care, too. The health condition of your skin or hair will become clear with a single gaze. Here, the focus hood comes to the aid by keeping the focus point always in position. Use the macro lenses singularly or together for a deeper check of your skin or hair conditions. The macro lens can also be extremely convenient for business use. For example, printing quality inspection at printing factory. In this situation, the focus hood will allow anyone to view and check the image at the same exact angle as it can secure the angle of the smartphone itself. Kenko REAL PRO CLIP LENS comes with excellent optics that will not let your expensive smartphone camera down. 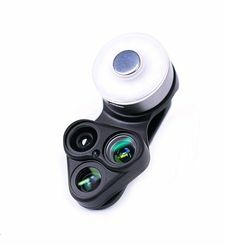 Optics with multi-layered coating precisely covered in aircraft aluminum alloy body finished by anodic oxidation will drastically change your image, but won’t change its quality. Kenko REAL PRO CLIP LENS series comes with universal clip. The clip has a unique and sophisticated design to provide best performances. Thanks to its exclusive construction, the clip is compatible with up to 30mm wide devices and monitors with built-in camera. Kenko REAL PRO 0.4x SUPER WIDE LENS is compatible with a range of devices including iPhone 7, 6, 6+, 5, 5C, 5S, 4, 3; Samsung Galaxy S7, S7 Edge, S6, S6 Edge, S5, S4, S3; iPad 2, 3, 4, Air and many more. SUPER MACRO & SUPER WIDE 165° The REAL PRO Double Super lens kit includes a Super Wide 165° lens and a Super Macro 6x lens. The Super Macro 6x lens is composed of two macro lenses with a different magnification power of 3x and 4x respectively. You can use the two lenses separately or combined together, for a 6x magnification power never experienced before until now!The focus hood included in the set will guarantee stable and blur-free pictures while keeping the subject always in focus. Challenge yourself in a wide range of fields with this REAL PRO Super Double Kit of “Super Macro & Super Wide 165°” clip lenses and bring your smartphone photography to the next level. The Super Wide Lens contained in this kit is an optical lens with 165° field of view that offers the best choice for shooting group photos, selfies, landscapes, and snapshots. The Super Macro Lens is an invitation to the curiosities of the macro world. It consists of two macro lenses with different magnification power. You can use the two lenses separately or, by combining them, shoot photos or videos with a 6x magnification lens that you have never been experienced before… until now! 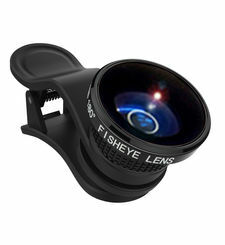 Focus HoodThe Super Wide Lens & Super Macro Lens Double Kit is also enriched with a new focus hood. Just by applying it on the surface of the object, the focus hood included in this set will guarantee stable and blur-free pictures while keeping the object always in focus. More and more people recognize smartphones as a high-performance camera. It is difficult to deny that smartphones with their advanced camera lens system and editing tools will continue to conquer the market in quite a confident manner. We believe that smart phones photography as an autonomous genre will keep developing to further provide users big possibilities to express themselves. Despite the big competition out there, Kenko offers a range of high quality optical add-on accessories for smartphones that will help you to show YOUR hidden talents to the world.This new REAL PRO CLIP LENS Double Super Lens Kit makes a further step forward by increasing the number of situations in which you can take great and impressive pictures conveniently with your smartphone. Kenko REAL PRO CLIP LENS Double Super Lens Kit provides different scenarios to be used in. 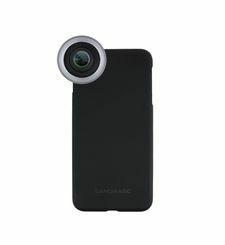 By including a super wide lens and a super macro lens, this kit has been conceived to cover all your everyday life situations, may they be at work, school or free time. With REAL PRO CLIP LENSES, your every day photos will become more impressive and creative.The Super Wide 165°lens is of particular help when your smartphone camera angle needs an additional conversional lens to cover the whole view you want to capture. 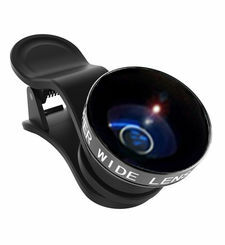 This Super Wide 165° clip lens will serve a great deal particularly in landscape pictures, group selfie photos or snapshots. The Super Macro lens, in particular, can be of much use in the children education process. Bring this lens with you out in the fields and look for any object your children get curious about. This is a great opportunity to let them into the wonderful world of macro. You can use the Super Macro lens in health care, too. The health condition of your skin or hair will become clear with a single gaze. Here, the focus hood comes to the aid by keeping the focus point always in position. Use the macro lenses singularly or together for a deeper check of your skin or hair conditions.The macro lens can also be extremely convenient for business use. For example, printing quality inspection at printing factory. In this situation, the focus hood will allow anyone to view and check the image at the same exact angle as it can secure the angle of the smartphone itself. 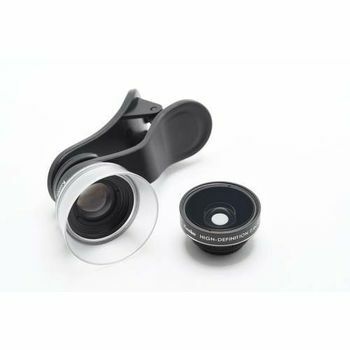 KENKO LENS DOUBLE SUPER MACRO REAL PRO CLIP Kenko REAL PRO CLIP LENS comes with excellent optics that will not let your expensive smartphone camera down. Optics with multi-layered coating precisely covered in aircraft aluminum alloy body finished by anodic oxidation will drastically change your image, but won’t change its quality. Kenko REAL PRO CLIP LENS series comes with universal clip. The clip has a unique and sophisticated design to provide best performances. Thanks to its exclusive construction, the clip is compatible with up to 30mm wide devices and monitors with built-in camera. The most versatile lens system for mobile gadgetsCompatibility Kenko REAL PRO 0.4x SUPER WIDE LENS is compatible with a range of devices including iPhone 7, 6, 6+, 5, 5C, 5S, 4, 3; Samsung Galaxy S7, S7 Edge, S6, S6 Edge, S5, S4, S3; iPad 2, 3, 4, Air and many more.